Tactical Therapeutics Inc (“TTI”) is a privately funded, clinical stage company that has developed and patented a lead therapeutic Carboxyamidotriazole Orotate (CTO)(Pravitinib(TM)) for the orphan indication glioblastoma (GBM) (fewer than 200,000 or 1 in 1500 persons are affected) and for other refractory targets. Rashida Karmali PhD, JD, Founder of TTI, Lead Scientist, Innovator, respected pioneer in cancer research and is a registered patent and business attorney specializing in drug discovery and development. TT has developed a strong portfolio of Composition of Matter patents, Biomarker patents, and Process and Use patents, including 8 U. S. Patents and 78 foreign patents with patent life extending to 2030 and beyond. 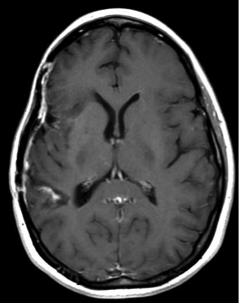 Glioblastoma (GBM), classified as a grade IV (WHO) astrocytoma, represents 50-60% of adult primary CNS tumors and differs from anaplastic astrocytoma (grade III) due to the presence of necrotic tissue and hyperplastic blood vessels. 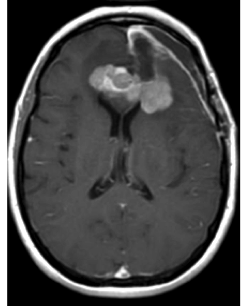 Glioblastoma grows rapidly and is the most invasive type of glioma, the malignant cells commonly spreading to nearby brain tissue, making complete surgical resection difficult. Tumors typically contain more than one cell type, a characteristic that makes glioblastomas very difficult to treat. GBM exhibits aggressive spatial and molecular heterogeneity with multiple gene amplification signaling pathways. 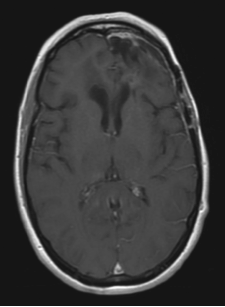 The current treatment options for GBM are limited and there remains a critical unmet need. The standard of care combination of surgery, radiotherapy and chemotherapy (Temodar®) generally results in an Overall Survival of 12 to 18 months, and about 20 months in combination with Tumor Treating Fields. GBM is highly resistant to common DNA-modifying chemotherapy since responsiveness depends in large part upon methylation status of the promoter of the DNA repair enzyme O6-methylguanine-DNA methyltransferase (MGMT). Epigenetic silencing of the MGMT promoter by methylation occurs in approximately 45% of the GBM patients, making them more sensitive to Temodar®. Current treatments often cause neurotoxicity, resistance and redundancy, and many do not cross the blood brain barrier. There is an unmet medical need for treatment as the current prognosis is only 8.7% of patients surviving two years. The therapeutic window for patients with recurrence is narrow. The treatment options for recurrent GBM are Avastin® and off-label use of several chemotherapeutic agents (lomustine). However, Avastin® does not improve Overall Survival and has serious side effects. TTI’s CTO is an oral inhibitor of non-voltage dependent calcium signaling that modulates several receptor-mediated calcium-dependent signaling pathways including EGFR, MEK, RAS, HDAC, HSP90, WNT/B-catenin, Akt, ERK, VEGF, and BCr-Abl. CTO has anti-inflammatory activity through inhibition of cytokines such as TGF-β, IL10, TNF-α, etc. CTO blocks out multiple pathways of cancer proliferation and metastasis, preventing the number one problem in cancer today, resistance and recurrence of tumors. In preclinical models, the antitumor activity of CTO alone or in combination with Temodar®, 5 fluorouracil, or paclitaxel was demonstrated in xenograft models of human glioblastoma, colon cancer, melanoma and ovarian cancer. A single-agent Phase I trial in 44 heavily treated advanced cancer patients determined the maximum tolerated dose (MTD) of CTO, with a safe toxicity profile. Nine patients with different refractory tumors (colon, NSCLC, head & neck, ovarian, renal) and various genomic mutations, responded to CTO and achieved stable disease up to 14 months. These results suggested a role for CTO in overcoming resistance in several types of solid tumors. ASCO 2013, J. Cancer Therapy, 2015,6:322-333. Results of a Phase IB study in recurrent GBM were presented at ASCO 2014, 2016. CTO given orally in combination with Temodar® showed a safe toxicity profile. Durable partial responses were confirmed in 7 of 27 patients with methylated or unmethylated MGMT GBM tumors. CTO crossed the BBB, and drug levels in resected tumor tissue were higher than in blood. ASCO 2016 Abstract 2064 presented by MSKCC. J. Clin. Oncol. (In Press) 2018. In a Phase IB study, 15 newly diagnosed GBM patients given CTO with Standard of Care surgery, radiotherapy, and Temodar®, achieved durable Partial Response and Stable Disease, and notably longer PFS and median OS in in methylated and unmethylated MGMT genotypes. Four patients continue in the study on CTO alone after completing 12 cycles of adjuvant Temodar®. Efficacy analysis is ongoing. ASCO 2016 Abstract 2060, by MSKCC. J. Clin. Oncol. (In Press) 2018. TTI is positioned to advance CTO into two Phase II/III registration-directed clinical trials as a potential new treatment for GBM in newly diagnosed and recurrent GBM patients. The story of Tactical Therapeutics is one of the most amazing ongoing narratives in the life sciences today. It all starts with Dr. Karmali’s completion of her PhD in Biochemistry in 1976. She then had post-doctoral training in tumor immunology and performed research at the Memorial Sloan Kettering Cancer Center and went on to run a research lab as an associate professor at Rutgers University for five years. Dr. Karmali became an expert and pioneer in cancer inhibition mechanisms and was recognized on the cover of Cancer Research for her work on Omega-3 fatty acids and COX2. Dr. Karmali published the seminal work proving Omega-3 fatty acids inhibited cancer by taking a different position that Omega 3 fatty acids were not tumor promoters as was commonly believed. In fact, her research proved that Omega 3 fatty acids had anti-tumor activity and had potential use in the emerging field of preventative medicine. Dr. Karmali then turned to law and became an expert in patent infringement litigation for high profile pharmaceutical companies including GSK and Merck, as well as being involved with IPO’s and tech transaction work. As the dawn of the Biotech era arrived Dr. Karmali was employed with Pennie & Edmonds LLP and Stroock Strook & Lavan LLP, the pioneering IP law firms in the world with a client stable of the who’s who of the up and coming major biotechnology firms globally. Dr. Karmali performed many of the major IP and patent assignments getting a rare inside view of how the new generation of drugs were being discovered and was intimately involved in all the nuances of their associated discovery processes in order to protect their IP. It was while working as a patent attorney that Dr. Karmali worked for a client with a promising therapeutic for multiple cancerous indications. The client was interested in evaluating the therapy for prostate cancer and due to her extensive cancer biochemistry knowledge; she decided to test the drug against a similar therapy in development at Merck – CAI. During the studies, it was found that forming a salt of CAI and Orotic Acid would in fact improve CAI’s bioavailability and tolerability. The new compound Dr. Karmali produced was CTO. She then patented and eventually bought the technology herself. She then formed TTI to bring this potent anti-cancer compound to patients in dire need of new brain cancer therapies. CTO maintained the remarkable anticancer properties of CAI, but had drastically lower toxicity as compared to the original compound. CAI, however, was never approved by the FDA as it was found to have unacceptable toxicity in as many as 16 clinical trials. Early pre-clinical development of CTO was funded by Dr. Karmali. It was during this stage that she had a shocking revelation. While in the process of searching for a manufacturer of CAI, one of the production steps involved a very expensive and toxic substance. This substance was also one of the likely explanations of the high toxicity seen in CAI. She developed an alternative pathway to synthesize CAI while completely removing any possibility for contamination. In addition to securing a new process patent, it was discovered that two new forms of the drug exist in separate crystal forms. During her time as a patent litigator, Dr. Karmali encountered many ways to increase patent protection. This scenario allowed additional layers of patent protection around CTO and giving new life to this revolutionary therapy. To fund early clinical trials, Tactical Therapeutics has since raised capital from a number of philanthropically motivated individuals devoted to bringing the therapy to patients in need. In Phase I, 9 of 44 terminal patients with different tumors and various genomic mutations, who were pretreated with multiple drugs, responded to CTO alone with stable disease up to 14 months. CTO has been tested in two phase IB clinical trials for malignant gliomas in brain cancer. 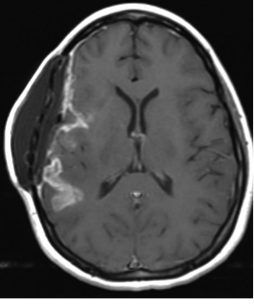 Glioblastoma grade IV (WHO) represents 50-60% of adult primary CNS tumors. GBM patients have unfavorable prognosis with an Overall Survival of 12-20 months depending on treatment. GBM is highly resistant to DNA modifying chemotherapy, especially in 55% of patients in whom the DNA repair enzyme MGMT promoter gene is not silenced by methylation. In Phase IB, in 27 recurrent GBM patients, CTO given orally in combination with Temodar® showed a safe toxicity profile. Durable partial responses were confirmed in 7 of 27 patients with methylated or unmethylated MGMT GBM tumors. CTO crossed the BBB, and drug levels in resected tumor tissue were higher than in blood. A randomized Phase II/III is planned. Omuro et al., J. Clin. Oncol. (In Press) 2018. In a Phase IB study, 15 newly diagnosed GBM patients given CTO Standard of Care surgery-radiotherapy-Temodar®, achieved durable Partial Response and Stable Disease and notably longer PFS and median OS in in methylated and unmethylated MGMT genotypes. Two patients continue in the study on CTO alone after completing 12 cycles of adjuvant Temodar. Median progression free survival was 15 months and median overall survival was not reached – median follow up, 28 months. (Omuro et al., J. Clin. Oncol. (In Press) 2018.) A randomized Phase II/III is planned. All of the mechanisms of action for CTO (Pravitinib) have shown to address multiple calcium dependent signaling pathways of cancer cell proliferation, metastasis, and immunosuppression in the microenvironment. This means that CTO modulates multiple signaling pathways and works in combination with traditional chemotherapy and targeted drugs to achieve clinical efficacy by preventing the number one problem in cancer today, resistance and recurrence of tumors.